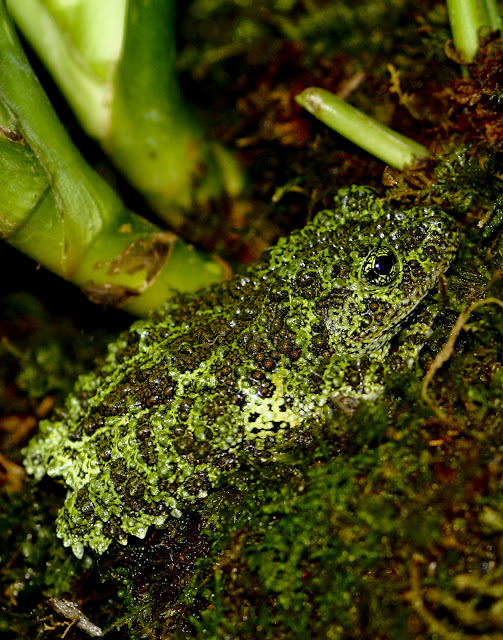 The Vietnamese Mossy Frog is the master of camouflage. With complicated blotches of colour and lumpy, bumpy skin, it looks just like a clump of moss. It's that amazing kind of camouflage where if you put it all alone in a white room, it would still look like a clump of moss. You'd be like "why's there a clump of moss in that white room?" And the warden would be all "that's Sebastian. Remember Crazy Frog? Multiply that by ten and add a sadistic knowledge of the human anatomy and centres of pain. If you look closely, you can see he's wearing a tiny straitjacket." Yeah, sorry. When I said white room I meant padded cell. Vietnamese Mossy Frogs aren't so bad in the wild, although they can, apparently, eat insects about the same size as their own head. Since they reach about 8 cm (3 in) long, that's pretty big. They come from northern Vietnam and a little bit into China, where they reside about 1,000 metres (3,000 ft) up on the slopes of certain mountain ranges. They like to keep near to streams and rivers that cut through rainforests which grow on rocky terrain. Here, they can spend their days resting underwater or on a rock on the shore. Now they can camouflage themselves by doing absolutely nothing, which is something all frogs are extremely good at. Even when frogs are deeply engaged in strenuous activity, they always seem to punctuate it with lengthy periods or quiet reflection. "Why am I doing all this... stuff?" they say to themselves. And if the camouflage doesn't work they curl up into a ball and play dead. This works because dead frog is worse than moss and also it's an even more intense form of inactivity. These guys got it made. 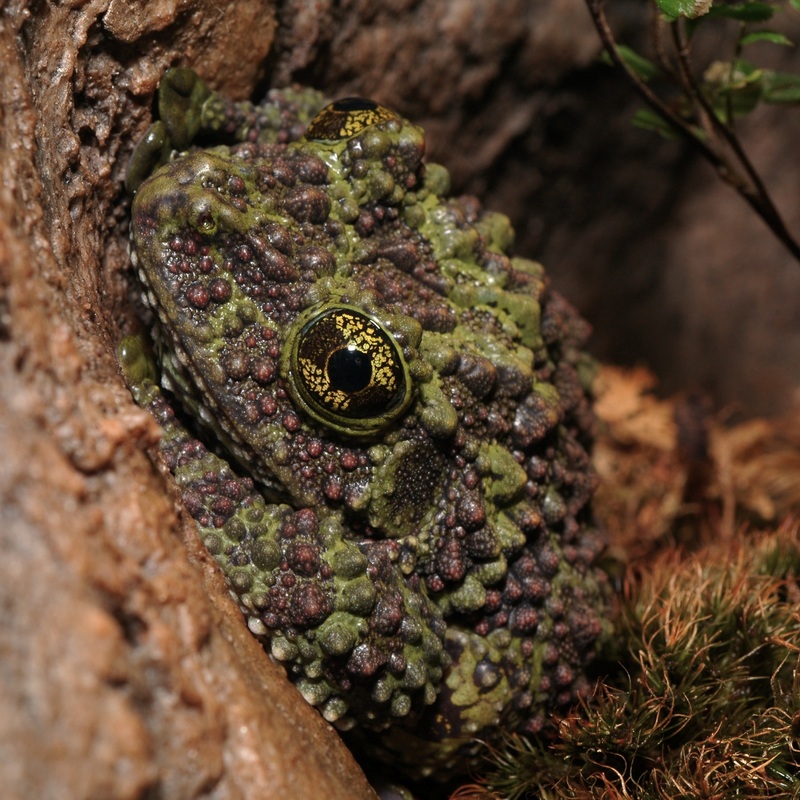 The frogs are active at night, when they seek out large insects to feast on. I suspect that's when their big, bulging eyes come into their own. Vietnamese Mossy Frogs are also known as Tonkin Bug-eyed Frogs since the northern region of Vietnam they come from is called Tonkin. Also they're members of the genus Theloderma. Member of this genus are known as Bug-eyed Frogs or Warty Treefrogs, so that's where the eyes and pragmatic skin texture come from! The "Treefrog" bit might also indicate the fact that Vietnamese Mossy Frogs have sticky pads on the end of their toes, so they can relax underwater, walk and jump on the shore and climb up a tree. The world is truly their oyster. They can relax and do nothing anywhere! 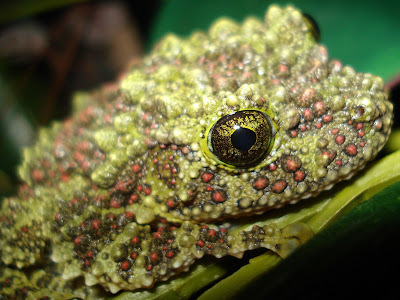 One time a Vietnamese Mossy Frog may want to go for a climb is when there are eggs to be laid. To avoid predators, eggs are deposited in pools of water within secluded areas like rock cavities or tree holes above the main river or stream. Only after hatching will the tadpoles drop into the dangerous waters below. A clump of moss doing nothing is one thing. A frog doing nothing is another. But when their powers combine you have something else. Doing nothing. This is probably why Vietnamese Mossy Frogs are quite popular as pets. They can breed in captivity so hopefully their wild brothers and sisters can be left to enjoy their freedom, too. They could send postcards to each other.